Hi there. My name is Ted, and I write this blog. I live in Seattle with my partner of almost 24 years. We live in the city during the week, in a 1929 building called The Gainsborough, and on Vashon Island on the week-ends, in a little house on the water, set in the woods, we have dubbed WestWard because it faces West and we both moved out West, so we found the name fitting. Plus I love the preppiness and Old World-ness of naming a house, as it seems like houses should have names too. Several years ago we bought 10 stunning acres in the Hudson River Valley, and have been in the process ever since of dreaming & scheming & designing our home from the ground up. It has been a very fun process from the moment we thought of living there part-time, and one day soon our house, named EastView, will be built. And how dare I forget, we do all of the above with our beloved pooch, Bailey. I am the owner of the retail shops and web site, Watson Kennedy. I feel fortunate every day that I get to do what I do. Owning retail shops allows me to travel, design, display, and work with cool people, both those that work for me, and those that are my customers. We have amazing customers from around the globe. The last few years I have sent out a monthly e-mailer to our mailing list, and the response to it has been amazing. It really has been the catalyst to me starting this blog. I love sharing ideas with folks, so this allows me to do it on a more frequent basis. Plus, working retail, for those of you who never have, can throw at you some pretty funny/wacky experiences. Some are just outright funny, and others are really almost hard to believe. For those of you who know me, you know a sense of humor & laughter is something I value tremendously. Well, believe me, some of my retail world experiences will bring a smile to your face, or just leave you shaking your head in disbelief. I hope to share some of those stories with you. 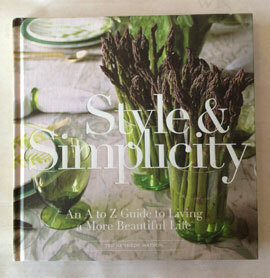 I love design, making guests feel comfortable, cooking a lovely meal, giving a great gift. Please join me on my journey. I think we will have a fun trip together! I was just introduced to your site and newsletter by a friend, Kristine Alana, who has a shop in Sonoma, CA (Kingston Ellis). I just have to say that I look forward to your emails and love your taste and sensibility. You’re FABULOUS!! Two questions: Did you teach tennis at Thprd and can you help me find a zig zag wine opener before Christmas? I hope both are true. My sister Brooke always raved about your stores and when I came to visit her in Seattle she knew how much I would love your stores. She knows how much I appreciate beautiful and unique things for gifts and my home. Watson Kennedy is always at the top of my list when visiting her in Seattle. I never leave Seattle without visiting your fabulous stores and buying a unique and very special keepsake for our home. Thank you for making the world a better place. You truly have a Gift in all that you do. p.s. Brooke needs to make us all a fad dinner when she gets back from passing her Paris exams and you both are up on your next visit! fortune of visiting your store. We actually found it by accident and I am still high from the experience. merchandising your products. I wanted everything in your store but alas, my suitcase only allowed for two tiny books: “I could pee on this.” (I bought 2 of them!) I hope you will consider Boston for one of your store locations. Thank you to my co-worker Janeen for turning me on to your site. I sent your rosemary candle to my sister in Florida and now we are in touch again. Please sign me up for your e mails…thanks, you’ve been recommended by Janeen Mount more than once! And I love Los Olivos too, my brother and sister in law live there…charming! Hi Ted. Please sign me up for your emails ~ Pretty Pink Tulips recommended you. I enjoyed an interior design career in Palo Alto many years ago . . . currently a Realtor in Charlottesville, VA and offer design services to many of my clients. I appreciate your unique sense of style and look forward to visiting your shop on my next visit to Seattle! Please sign me up for your email. I discovered you via your book on Amazon. Your big is so excellent. I especially liked the handwritten envelope comments. Hi Ted, from your favorite admirer Paula, here in Kansas City . This is a message to tell you how much I enjoy reading all about you and your life. My how you’ve grown. How beautiful it ALL is. OMG Just saw your reply. New kid on the block. ha…. I will do better now. I just talked to your mom this a.m. and told her to get with one of her grandkids to see YOU. She did tell me about your book and I would LOVE to read it. How do I sign up to receive your blog?? I keep trying to join your web site. Hi. My partner and I are visiting Seattle in July. My partner is a Regional Digital Advertising Executive with a major news company. It is my first trip to Seattle, and I cannot wait to visit your shops. Can you please give me suggestions on restaurants, shopping, etc? I would appreciate it greatly. I follow your blog and love your style. I just purchased your book and sat down on the sofa to read it. What a pleasure it is to find another kindred spirit who delights in the details and truly appreciates the beauty of daily life. Can’t wait to read the rest of your blog, and hope to visit your store one day! Thanks for a lovely afternoon. Hi Ted, Your blog is a treasure that I enjoy every day. I am looking forward to reading your book as well. Thank you for the beauty that you share with the world. I love your store though have never visited your site or blog. Fabulous. Also, I live on First Hill and regularly walk past the Gainsborough and feel lucky to have beautiful buildings like that to look at. Often, I fantasize about what sorts of people are living in it and my husband laughs and insists it’s 23 year old tech wizards with posters on the walls. Thank you for helping me reclaim my vision (and dismissing his) as to what at least one of those interiors might look like! My husband and I just received a votive as a gift (might I add that it is a delicious one at that). After taking one sniff of the votive and I was off to the internet typing as fast as I could…Ted Kennedy Watson.com. After reading JUST the blog I am sold. The feeling I got from Ted as I was reading totally made me feel as if I was sitting face to face with him it was so down to earth and “real”. Can’t wait to experience TKW to the fullest. Love your stores. Just learned of your blog. Help! Please add me to your blog. I just found your blog site. Lovely – inspiring – creative and most of all filled with your love and energy which is so evident in your writings, pictures. I shall be a fan and follow along with you. I live in Las Cruces NM and have a thrivingart card hobby/business. Life is good. Will be even better with your blog to follow. Love your site, I just found you. Will definitely follow you. your energy and love and inspiration is so evident in all your writings and love of life. thanks for sharing. I’m a card creator and artist and living in Las Cruces NM. My name is Robyn. Please add me to you blog. We live in Texas for now, and are planning to move to Oregon. We will be in Seattle tomorrow and plan on visiting your store at Pikes Market. My name is Robyn. Please add me to your blog. We live in Texas for now, and are planning to move to Oregon. We will be in Seattle tomorrow and plan on visiting your store at Pikes Market. You bring joy into my life, with your warmth and love of all things beautiful. There should be more people like you around. And your photos are sublime! I have followed your blog for years. If I ever get to Seattle , your shop will be my first stop. You have a wonderful attitude on life and enjoying each moment.